Charlotte is no stranger to being on national television. The Queen City has had several of it’s local spots featured on “Diners, Dive-In’s and Dives”. The Improper Pig, Bang Bang Burgers, and the Landmark Diner to name a few. We have another one to add to the list, Metro Diner. A hometown family restaurant from Jacksonville, FL serving up comfort, smiles, flare and warm welcomes since 1938. They are not new to North Carolina with three other restaurants in Raleigh, Fayetteville, and Pineville. They just opened a new restaurant in Matthews and there is one coming soon to Huntersville. You can also find them in eight other states if you’re on any road trips: Alabama, Delaware, Pennsylvania, Virginia, Nevada, Georgia and Indiana and of course their home state of Florida. Their dishes might seem familiar in name but Metro Diner puts a couple new tricks in there to make it their own. Having lived in PA for a couple years I immediately recognized the Steak Salad as a Northern dish. They enjoy cooking and creating their own ideas that stem from local favorites. Take their Shrimp ‘n’ Grits dish for example, it’s made with a shrimp gravy sauce rather than a traditional tomato base or their San Francisco Benedict with avocado and tomato. Metro Diner offers familiar yet unique menu options that make it a bit more fun that just eating bacon and eggs, which is still a staple order of course. It’s good to try something new from time to time and this is the right place to do it. 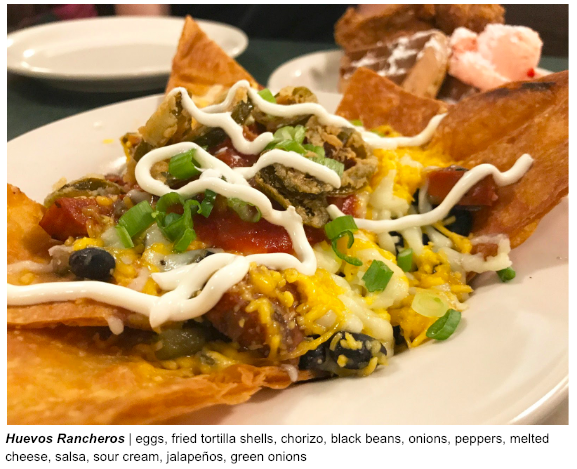 A few dishes I know very well were put to the test at Metro Diner’s newest location in Matthews, and I was pleasantly surprised at their vision for each. True to the original ingredients with only a small twist. My favorite was the Chicken and Waflfes, mainly due to the sweet strawberry butter. I have never had fruit butter before. I didn’t even know it was a thing until now. Secondly was the Shrimp ‘n’ Grits because of the cheesy grit cakes. Yum. I’ll be ordering a few more dishes next time to try out... Pound Cake French Toast, Chicken Pot Pie, and Yo Hala on the Square which is two slices of challah bread stuffed with bananas, brown sugar, cream cheese and hazelnut syrup topped with a blueberry strawberry compote and powdered sugar...wow. I will probably need several cups of coffee to wash that down!